It’s long been a matter of public record that North Carolina conservatives and their allies in the right-wing “libertarian” think tanks and “pro-family” advocacy groups long ago sold their souls to the devil when it comes to Donald Trump. The lure of power and/or access to it was so overpowering that it quickly obliterated any pangs of conscience that might have afflicted groups and individuals for whom Trump’s values, immorality and serial dishonesty were directly contrary to their professed core beliefs. Trump may be, as Pope Foundation director John Hood called him last year, “completely unqualified to be commander-in-chief” and “a contemptible human being,” but that doesn’t stop Hood and his patron Art Pope from funneling cash to groups like the Civitas Institute and its sub-grantee, the outrageous Carolina Plott Hound, that exist, in large measure, to defend Trump and his policies. Still, as depressing as this two-faced behavior has been, it’s one thing to defend Trump’s policies and turn a blind eye to his deceitfulness and possible personal criminality in the service of “conservatism.” It’s quite another to affirmatively embrace the many grotesqueries of Trumpism as one’s blueprint for governing. Tragically and rather remarkably, it’s this latter scenario to which North Carolina’s Republican legislative leadership seems now to be adhering. Five months into his presidency, Donald Trump is no longer just an inconvenient tool for the Right in North Carolina; he has become the role model. If you think this is an exaggeration, take a closer look at some of the guiding premises of the budget bill approved by the General Assembly last week and that Governor Cooper announced he would veto yesterday. Some inattentive observers may be characterizing the budget bill in “ho hum” terms as a “compromise” between the conservative House and the ultra-conservative Senate, but the truth of the matter is much more sinister. In area after area, the legislation is a monument to Trumpism at its cynical worst. At the heart of the budget’s many Trumpian shortcomings is its startling dishonesty. In the past, of course, GOP leaders have gotten in public hot water for aggressively and openly advancing a right-wing agenda that dismantled public structures and services like education and environmental protection and then bragging about it. Now, these same leaders have wised up and learned – like Trump – to camouflage their extreme policies with the cloak of warm and fuzzy talk about supporting teachers and about helping people. Though he does a poor job of scrubbing away the meanness that infects virtually every written utterance that emanates from his office, Senate leader Phil Berger claimed in a statement that the budget was principally a “bipartisan” effort to aid teachers, hurricane victims and the middle class. This was, of course, absurd. The budget, in fact, shortchanges teachers and abets the ongoing sell-off of our public schools, doubles down on years of regressive tax giveaways to the rich and fails miserably to address the aftermath of Hurricane Matthew. “The final budget agreement not only rejects a positive vision for building a more inclusive, competitive economy, it actively seeks to dismantle the institutions that support quality education, workforce and economic development and health care. It puts North Carolina on dangerous fiscal footing. Failing to invest adequately in the state’s schools, environment, courts and well-being will not only result in the loss of jobs and opportunity in the near-term, it will fail to address the underlying economic challenges like inequality, chronic underinvestment in communities of color and rural underdevelopment that threaten our state’s economic future…. Donald Trump is nothing if not an incurable grudge-holder and the proposed budget contains some of the most egregious and outrageous examples of that brand of petty political behavior seen in North Carolina in years. As was reported in this space last week, the budget takes the remarkable step of slashing legal aid for the poor at a time of terrific need in order to, according to informed sources, assuage the demands of a well-connected lawyer with a longstanding bee in his or her bonnet about a local legal aid program. About the only thing that would be more blatantly “Trumpian” in terms of base score settling would be for lawmakers to have slashed the budgets of the Governor and Attorney General themselves in order to hamstring them in carrying out the basic duties of their offices. Oh wait, they did that too. What’s more, that may not be the end of the revenge-taking. Word on the street in Raleigh is that GOP leaders have been “taking names” when it comes to recent “no” votes on their agenda and that more payback could be in the offing when lawmakers craft the catchall, budget “technical corrections” bill in the final days of the session. Anyone who pays any attention knows that Donald Trump will not hesitate for even a second to abandon any pretenses of “fighting waste in government” to redirect public resources whenever possible to supporters, friends and family members. Republicans in charge of the General Assembly, however, ran on a platform of opposing “pork barrel” spending of this kind when they came to power. “Sen. Berger and House Speaker Moore and their lieutenants went behind closed doors and at the last minutes doled out $100 million in taxpayer money that was in neither the House nor Senate budgets. They picked out nonprofits in certain counties to reward allies and try to gain others and to take care of their own communities. The budget even took the extraordinary step of directly handing out $600,000 in public funds to a Texas-based anti-abortion advocacy group started by a pair of fracking billionaires. Last, but far from least, in the litany of Trumpian tactics employed by lawmakers was the utter lack of process and transparency employed in crafting the budget. Simply put, vast swaths of the budget were written in secret behind closed doors. Lawmakers didn’t even pretend otherwise. 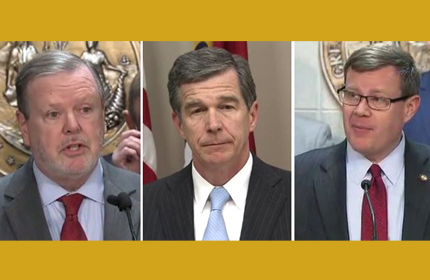 Numerous provisions – including much of the pork and the broadsides against Governor Cooper and Attorney General Stein – weren’t in either the House or Senate versions. They simply appeared at the last minute in the “conference report” that was supposed to iron out the “differences” between the two proposals. Legislative rules explicitly bar such insertions, but legislative leaders, in an act that would have warmed the heart of the nation’s ultimate autocratic “deal-maker,” simply ignored this inconvenient fact. Legislative leaders will, of course, quickly engineer an override of Governor Cooper’s veto. Then, like the prevaricator-in-chief himself, they will undoubtedly issue a series of strutting and boorish statements describing how masterful their leadership is and how pathetic anyone is who questions the wisdom of their actions. After that, they’ll unveil and pass a bevy of bills with little or no debate on an array of new subjects and, with any luck, adjourn the 2017 session in time for the July 4th holiday. And like Trump, they will act without any recognition or acknowledgment of the blatant disconnect between their treacherous governing maneuvers and the principles that holiday is meant to celebrate.